Control which notifications your staff will receive, and whether they’re sent via email, SMS or both! The Ento Notification Centre lets you choose which actions and events should notify staff via SMS, whether an email is sufficient or if they don’t need to be notified at all. Actions such as shift updates can be crucial last-minute changes that staff need an immediate update for, whereas Roster Summaries may be sent weeks in advance and can be opened when they have time. 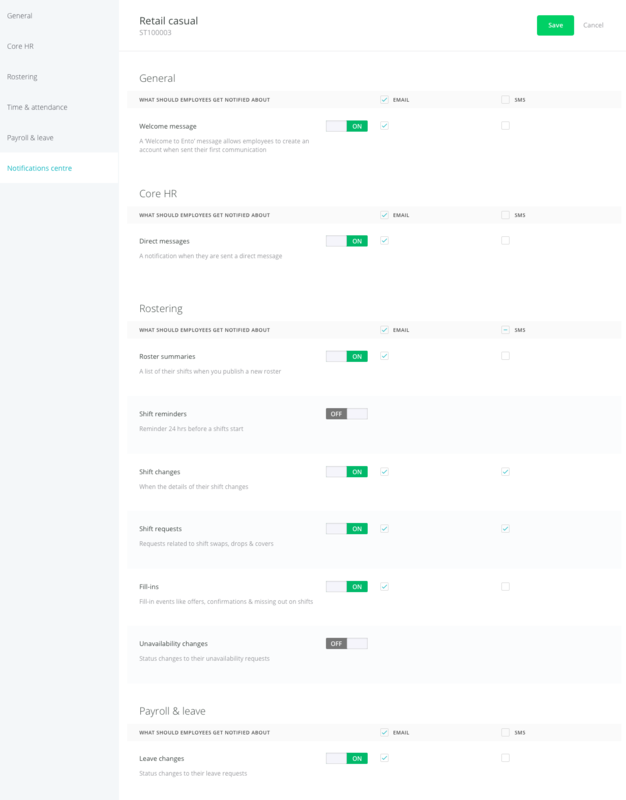 As the Notification Centre is housed within the Staff Permission profiles, different groups of staff can have different combinations of notification settings, all dependent on your needs. Navigate to Settings > Staff Permissions and edit a specific profile to find the Notification Centre tab and make changes. Note that these settings depend on the ‘Send to’ settings chosen on each staff profile page under Core HR > People > Staff. This means that you’ll need to turn on both those settings before the Notification Centre can take effect. Similarly, if you choose to untick ‘Notify staff’ when updating a published shift, it still won’t send any notification.